It’s all smoke and mirrors, folks! A lot of mainstream press was given to Presidential hopeful Barack Obama when he spoke to veterans in Colorado earlier this month. On July 2nd, Obama spoke in Colorado Springs before a group of veterans. The context of his speech was to contrast his military experience and agenda with that of his main opponent, John McCain. 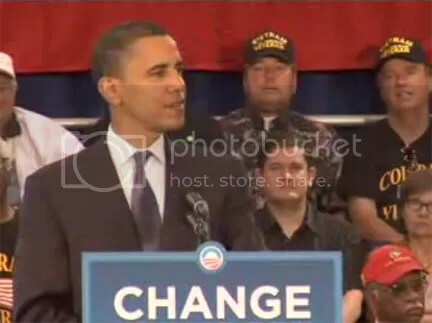 At the rally, Obama said he hopes the military community will see him as “a guy looking out for us and not someone trying to score cheap political points.” Really? Is that why Barack stocked the audience behind him with members of “Colorado Veterans”, an anti-war group based in the area? After all, it was an invitation only event. “Colorado Veterans” is another one of those kook organizations calling for the impeachment of Bush and Cheney and also prominently display the death totals on their website, highlighting a supposed toll of poor, Iraqi children killed “in cold blood” by the murderous United States troops. They are an anti-war group along the lines of IAVA, only more localized…. Filed under: CJ A Soldiers Perspective, Obama smoke and mirrors |	Comments Off on It’s all smoke and mirrors, folks!